We work closely with local universities to provide benefits to the thousands of students, faculty and staff who live, work and play in the Triangle. Find information below on Duke University, North Carolina Central University, North Carolina State University, University of North Carolina - Chapel Hill, Wake Tech Community College and others. With more than 35,000 employees and 15,000 students, as well as millions of patients and visitors each year, Duke encourages staff, faculty and students who commute to campus to explore multimodal transportation options. Duke University and Health System offer many incentives to save on fuel and parking fees while contributing to the mission of a carbon-neutral campus. As part of Duke’s continuing efforts to reduce congestion and create a more sustainable campus, Duke Parking & Transportation Services offers a carpool program with an array of benefits including discounted and preferred parking. The carpool program is open to Duke staff, faculty and students who have a vehicle and live off-campus. Staff, faculty and students who bike to Duke may register to receive shower access, free occasional parking, and enrollment into the national Bicycle Benefits program. Students and employees can also borrow bikes through the LimeBike and Spin bikeshare programs operating on campus. For individuals who need access to a vehicle, Enterprise CarShare offers hourly and daily rentals on campus 24 hours per day, 7 days per week. Car-sharing provides Duke students, faculty and staff with a convenient and eco-friendly way to get around without owning a car. Duke works with GoSmart to organize a vanpool program for employees. Not only do GoTriangle vans park for free at Duke, but GoTriangle provides the van, pays for gas and insurance, and arranges, oversees and pays for all maintenance. Riders pay a low monthly fare based on monthly round-trip mileage, and Duke contributes $10 per month per student or employee who chooses to vanpool. The primary driver does not pay. Many students, staff and faculty who live near Duke choose transit. Duke Transit operates 11 daytime routes and 2 weekend/nighttime routes around campus. Duke offers the GoPass, to students and employees, which allows unlimited rides on GoDurham, GoRaleigh, and GoTriangle buses. The Bull City Connector, a fare-free, hybrid-electric bus service also connects downtown Durham with the Duke University campus and medical facilities. WolfTrails provides NC State employees and students alternative transportation options for getting to and from and around campus including biking, carpooling, vanpooling, walking, or transit. WolfTrails offers incentives to encourage the campus community to make environmentally sustainable travel decisions, save money and improve their quality of life. For directions and hours of operation, please visit www.ncsu.edu/transportation. 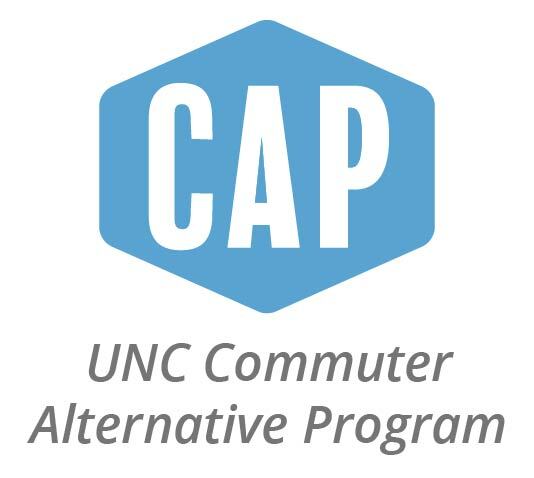 UNC-Chapel Hill’s Commuter Alternative Program (CAP) incentivizes students and employees to not drive alone to campus. CAP members receive many benefits: a discount card, entry into monthly prize drawings, free Zipcar membership, a monthly e-newsletter, free occasional-use on-campus parking, and subsidies for eligible commute options. CAP and its initiatives support UNC sustainability goals. Whether it’s for attending class, work, or just for a visit, there are many different alternative transportation options for getting to and from UNC. Transit: Chapel Hill Transit – A fare-free system serving UNC, Chapel Hill, and Carrboro. U and RU Routes – Daytime circulators from South Campus to North Campus. P2P Express – Nighttime circulator from South Campus to Franklin Street. GoTriangle – Regional service connecting Chapel Hill to Durham, Raleigh, and other parts of the Triangle. Piedmont Authority for Regional Transportation (PART) – PART Route 4 serves UNC from Alamance and Burlington counties. Chatham Transit Network ­– Express bus from Siler City and Pittsboro serving UNC. Park & Ride: Commuters and visitors can park at a designated Park & Ride lot and take a bus into UNC. Daily, weekly, and annual permits are available for purchase for lots across Chapel Hill and Carrboro (served by the fare-free Chapel Hill Transit). Free Park & Ride lots across the Triangle and Piedmont are served by GoTriangle and PART. Rideshare: Carpool – UNC students and employees can use their UNC login for North Carolina’s statewide ride-matching service, ShareTheRideNC, to find carpool matches. Vanpool – GoTriangle and PART offer several vanpools coming to UNC from various locations around the Triangle and Piedmont area. Carshare: With Zipcars scattered around campus, available for an hourly or daily rate, it is easy to live or work at UNC without bringing a car to campus. Bike: UNC students, faculty, and staff who bring a bike to campus are required to register their bike. Registrants will receive a coupon for 50% off a U-Lock from Student Stores. UNC is recognized nationally as a silver-level Bicycle Friendly University. Campus offers bike racks and repair stations. Bikeshare: UNC’s new bikeshare program, Tar Heel Bikes, arrived in Fall 2017. 100 bikes are available at stations across campus for rental. Everyone can ride for one hour free with the Daily Plan! UNC students and employees can sign up for the Lifestyle Plan to ride for two free hours per day. Walk: UNC provides multiple resources to help keep pedestrians safe. Wake Technical Community College is North Carolina’s largest community college, serving nearly 2,000 employees and over 70,000 students annually with six campuses, two training centers, multiple community sites, and a comprehensive array of online learning options. The Wake Tech Green Trek (formerly ZOOM) program is a green initiative designed to reduce the college's carbon footprint by increasing participation in alternative transportation options, such as transit, carpool, vanpool, biking and walking. Personalized commute planning and assistance is offered by Wake Tech’s Transportation Coordinator to all students and employees. In 2016, Wake Tech was designated a Best Workplaces for Commuters. Public Transit: Wake Tech partners with regional transportation providers to encourage the use of public transit. A GoRaleigh express bus, route 40X, runs from downtown Raleigh to Wake Tech’s Southern Wake Campus every half-hour and is free for Wake Tech students and employees. GoPasses are also available at no charge for both students and employees to use on any other GoRaleigh route. Our Southern Wake Campus, Northern Wake Campus, Public Safety Education Campus, Perry Health Sciences Campus and Beltline Education Center are all well served by transit. Carpools and Vanpools: As part of Wake Tech's continuing efforts to lower carbon emissions and traffic congestion, Wake Tech encourages students and employees to use the online rideshare system, Share the Ride NC. Subsites are available for both students and employees to ensure safe matches. Wake Tech also works with GoTriangle to organize vanpools for employees. Vans provided by GoTriangle park for free at Wake Tech. GoTriangle provides the van, pays for gas and insurance, and arranges, oversees and pays for all maintenance. Riders pay a low monthly fare based on monthly round-trip mileage. As an added incentive, prefferred parking is available for both student and employee carpoolers. Biking and Walking: Bike racks are available at most of Wake Tech’s campuses. For more information, visit our website. Green Trek is also on Facebookand Twitter.